Discussion Multi line Tag Line in logo content box? The Logo content element allows you to add a single tag line. Scroll down in the Basic tab of the content element to find the entry point. 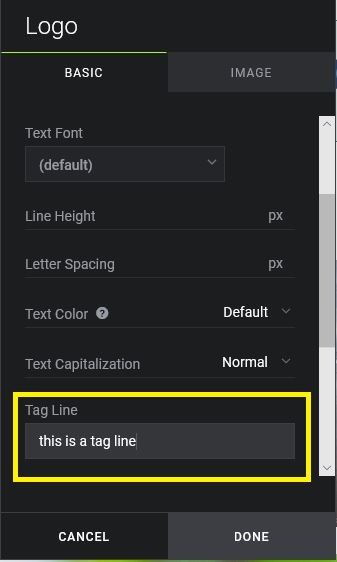 I haven't found a way to insert a line feed to create multiple lines. Mike, that's an interesting idea. I was hoping for a way to do that so it uses the same formatting/CSS as the logo content block. Is there an elegant way to do that, or would I have to do is manually? What same formatting are you talking about? FWIW, I use a HTML/CSS block for my logo. I use WordPress for my website and SM for my galleries, so I needed to make them both match. Using a logo block made my logo "blurry" compared to my WP site, so that's why I went that route. Ah, I see. The formatting I was mentioned was all the divs and classes used to make the logo entity look nice. I wound up just copying the code and pasting it into the html block to get it to look right, then added the extra tag lines, and wouldn't you know it- I didn't like the way it looked. So now I'll try a different approach. Thanks for the help everyone!